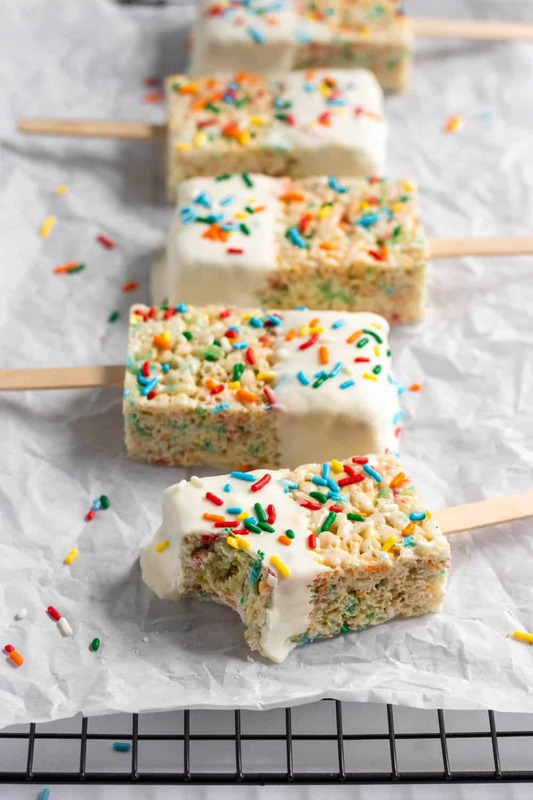 These Funfetti Rice Krispie Treat Pops are perfect for any party! 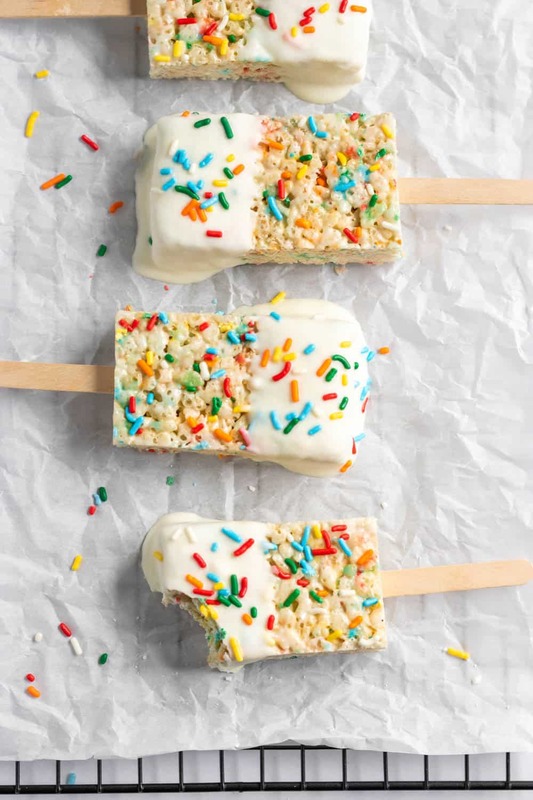 These easy no bake treats are dipped in white chocolate and great for little hands and adult hands too! Less mess and sticky fingers too! Just saying the word “Funfetti” puts me into a good mood. 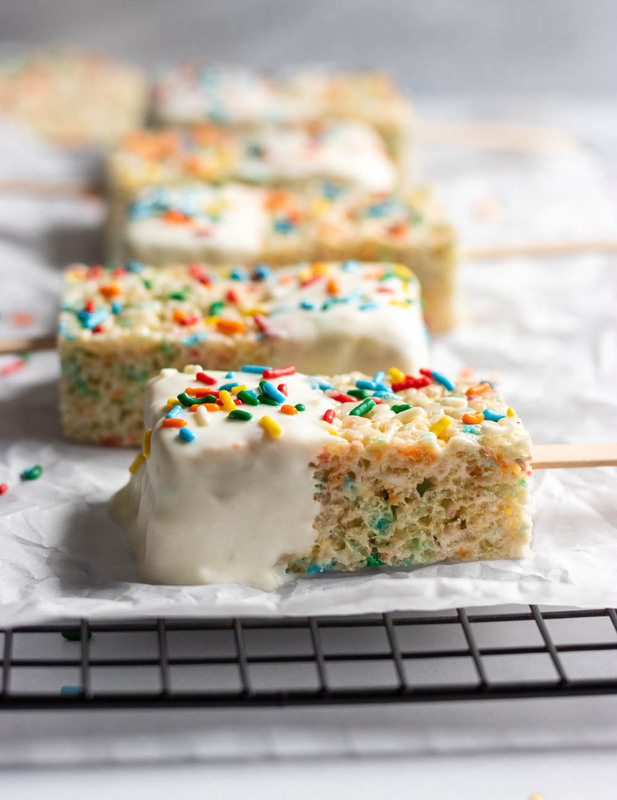 So imagine what eating these Funfetti Rice Krispy Treat Pops does! “Taste the rainbow” may belong to Skittles, but boy, oh boy, I would much rather be diving into rainbow sprinkles any day! And it is a proven fact that sprinkles can instantly make ANYTHING better: cake, cupcakes, doughnuts, and so much more. I know I have mentioned more than twice here that I got my little sis to eat peas by putting sprinkles on them we were kids. They are just magical! 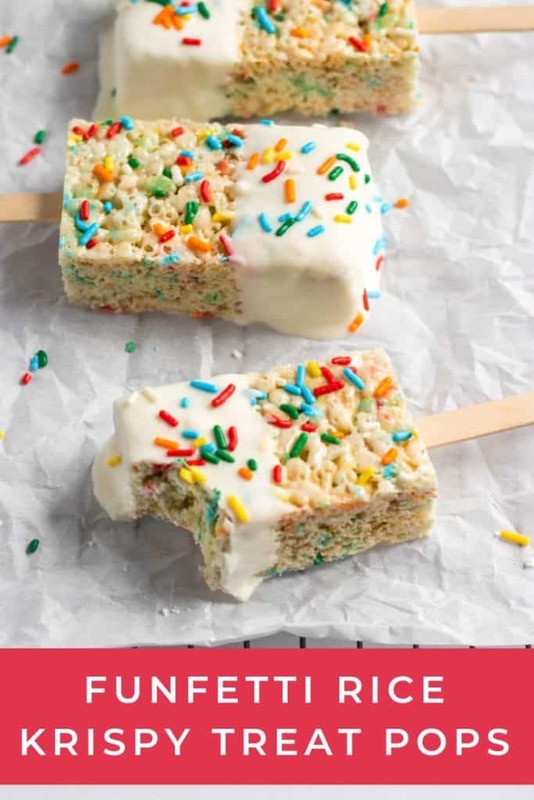 So I know that technically Valentine’s Day is right around the corner and you probably would love to see these Funfetti Rice Krispie Treat Pops with pink and red sprinkles, but I personally think that your Valentine will enjoy these just as much, if not more! The rainbow makes these much better for all year round, but if you have a special holiday you want to fashion these babies for, by all means, please do! Red and Green for Christmas; red, white and blue for 4th of July; pastels for Eastier, I mean the list is endless. But when in doubt, certainly RAINBOW it out! I know what you are thinking, those look like they might be a bit complicated to make. Fear not, friends, these are super duper simple. Nothing more than making the treats, cutting and dipping. Popsicle sticks press nicely into the treats and eating them that way is fun and so much less messy. Do I hear another YAY?! 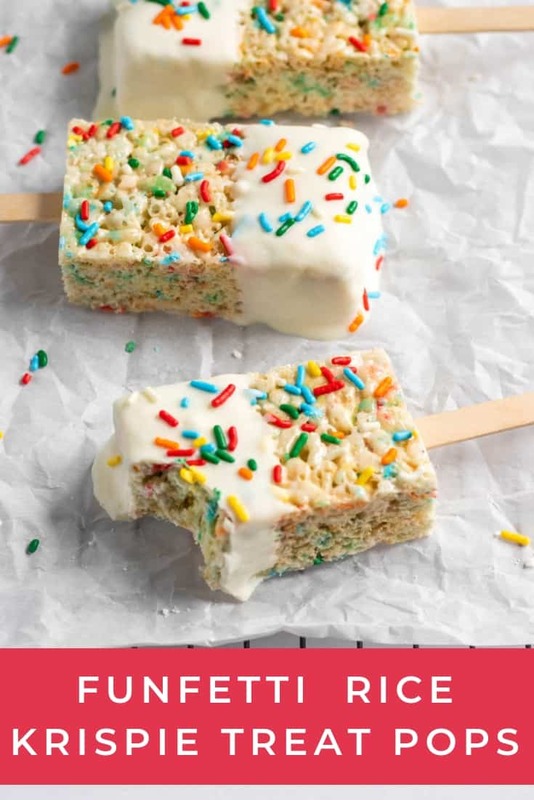 I have never had a Rice Krispy Treat with white chocolate but I am certain after having these I don’t wanna have one without. The combo of the gooey marshmallow, the crunch of the Krispies and the milky sweetness of the white chocolate is the trick-fecta of sweet perfection. You will know soon enough when you take your first bite. And while they are super cute dunked in the chocolate only on the end, you may be disappointed when you get to the half without the white chocolate. The solve for that? Make sure to go with a nice deep dunk into the chocolate! When you add the sprinkles in right after melting the marshmallows, those sprinkles will melt. As advised in the recipe, save the recommended amount and press them into the top after everything has cooled. Otherwise, you will not have any whole sprinkles in the pops. They will just be little speckles of the dye. If that doesn’t bother you, then you can toss them all in at once! Use a coffee mug or short glass to dip the pops in so that you can get a good amount of depth and a pretty even line across the pops as well! Like I said earlier, any color sprinkle will do! Make them the colors of your favorite team, holiday themed or whatever your heart desires! I have not tried these with a dairy free butter substitute, but I imagine you would still get similar results. Just make sure to use non-dairy white chocolate if you have an allergy! 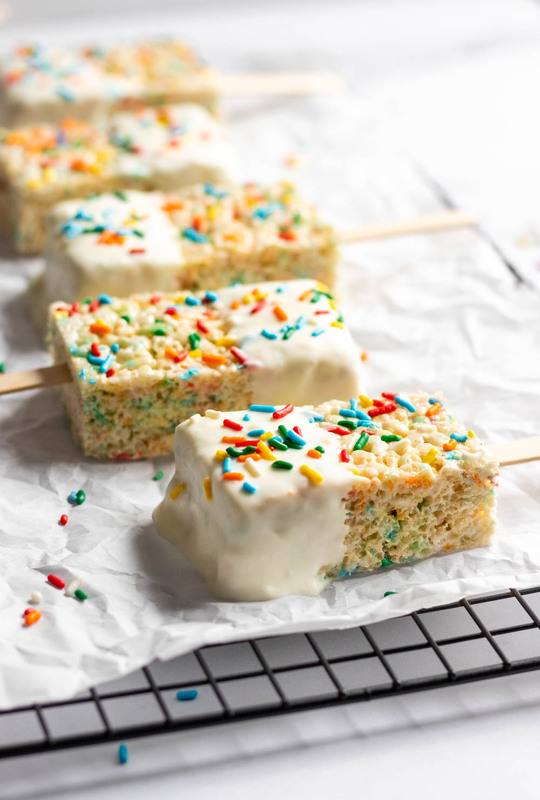 Rice Krispy treats do not stay fresh for long. You are lucky to get two to three days tops after making them even in an air tight container. 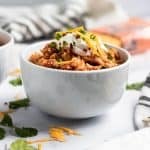 Try to make them as close to the day you plan on sharing them for peak freshness! Love Funfetti? 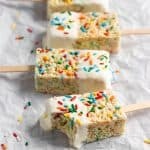 Try my very favorite Funfetti Cookie Dough Bites! 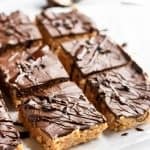 Also, check out these simple Peanut Butter Cup Rice Krispy Treats! In a medium pan, melt butter over medium heat. Add in marshmallows and vanilla and stir constantly until all marshmallows are melted. In a separate large bowl measure 6 cups Rice cereal. Pour marshmallow mixture over the cereal, add two T sprinkles and stir well to combine. (Sprinkles are gonna melt, just be aware. If you don’t like that look, just wait and add to the top). Prep a 9x9 inch pan with parchment paper. (I spray with a touch of oil). To make pops: cut into 12 even pieces, approx. 2 in by 3 in. Press a popsicle stick into each. Melt your white chocolate (using double boiler method or by microwaving in 20 second increments until melted) and add to a coffee mug to allow depth to the dipping. Dip each into the chocolate and set on parchment to dry. Add more sprinkles to the white chocolate if desired. Enjoy!! !